Cleveland's Got Sole returns for their fourth show this upcoming June. Sneaker events have become big business in recent years. They provide fans with a platform to buy, sell, or just show off their best kicks, and also a chance to interact with each other outside the confines of the Internet. They also provide a money-making opportunity for the promoters who organize them, which is no small task. As these shows get bigger and bigger, more and more work is required. And that's what makes Cleveland's Got Sole such a notable event. The show has outgrown it's previous locations, and will be hitting the floor of the Quicken Loans Arena this June. But desptite the tremendous growth (and increasing amount of effort) the show has seen over the past few years, it's still doing it for all the right reasons. "We are very excited to be working with The Children's Tumor Foundation as our charity again," explained Kevin Kramer, who co-chairs CGS along with Andrew Watts. "100% of the proceeds from the event will be donated to The Children's Tumor Foundation. They will be well represented at the event so people can get more educated on what their organization is all about." 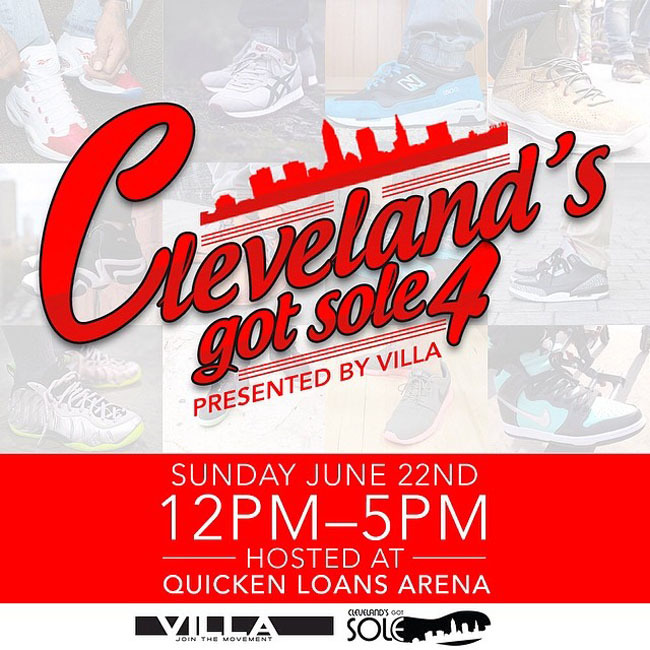 Presented by Villa, Cleveland's Got Sole 4 will be held on June 22nd from 12-5, as previously mentioned, at the home of the Cleveland Cavaliers, the Quicken Loans Arena. (Don't worry, the NBA Finals begin June 5th, so just in case the Cavs make it, the playoffs will be over by then.) The last event featured 125 tables, and upwards of 200 are exptected this time around. If you're interested in displaying or selling, hit up info@clevelandsgotsole.org for registration info, and check back for more info as the event approaches.